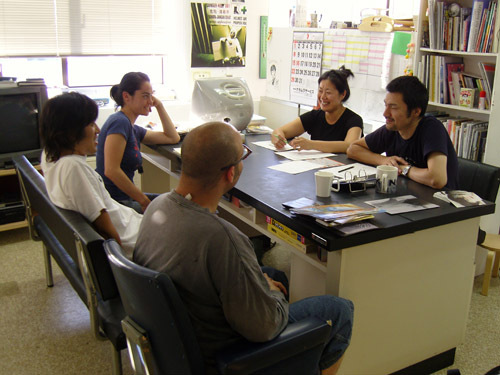 S-AIR resident artists Cecilia Ramirez-Corzo Robledo and Michael Jason Baers have a discussion about the final show available venues with S-AIR staff Takashi Homma, Mami Odai and Tomohiko Ogawa. S-AIR does not have a permanent exhibition space yet, so the venue has to be found and rented. which is an indipendent artist's studio and project space. The artists in residencies will have two separate shows in different venues. with this kind of reality. Cecilia will show in an empty room in an offices' building in the northeast of Sapporo, near a beer factory.